Cardiff City boss Neil Warnock will appeal against his FA disrepute charges after he called Premier League referees the "worst in the world". 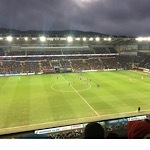 It follows controversy in Cardiff's 2-1 home defeat by Chelsea on March 31 when the Blues scored an offside goal. "I've pleaded not guilty to the charges and I expect to have a hearing some time this week, I hope," Warnock said. "But it can't come early because we've got a game (Brighton) on Tuesday and I've got a funeral on Wednesday." Warnock said the match at Brighton is a "point of no return" in Cardiff's effort to avoid relegation. Following Saturday's 2-0 defeat by fellow strugglers Burnley, the Bluebirds occupy the final relegation spot and are five points adrift of nearest club Brighton, who have a game in hand. Cardiff have been among the favourites to go down since being promoted from the Championship last season. Warnock called on his players to take inspiration from Tiger Woods' remarkable Masters victory on Sunday. "I thought we had to beat Burnley and Brighton, so it becomes even more important for both teams," Warnock said. "But you have to be optimistic. We have had that many kicks in the teeth in the last four months we keep bouncing back. "We just have to look at the golf and look at what Tiger has done - amazing! Nobody gave him a chance either. "It's an opportunity for us to give ourselves a chance until the end of the season. We have to grab that." Warnock reiterated that he would like to continue as Cardiff boss even if they are relegated, amid speculation that he would be sacked by owner Vincent Tan. "I can't do anything about that. That is football. He (Tan) has told me a few times everybody's ringing him with managers' names to get rid of me. That's how he talks. That's why I get on well with him," Warnock said. "I suppose a younger manager would worry. I don't think anybody could do any better and I don't see anybody doing any better next season if the worst happens. "I have not spoken to him but if he felt it was the right thing for the club then so be it."